>>”From the correspondence of Joseph Kanaki, 16 January 1943:” Dear Mother, I’m not sure if being at our wits’ end or being overwhelmed and split up is worse. Let me take a deep breath and step back for a moment. We had pursued U.S.O. entertainer Lucy McIntyre and her kidnapper, mad scientist Zylor Bar (Zī-l&# 333;r Bâr, also known as Thuran Gan), into Barsoom of about 1 million years ago, when Mars wasn’t the dying world the crew and passengers of the “Lucy Goosey” had first found ourselves on. Instead, we found a lush planet with yet more intrigue. We had followed pilgrims worshipping the false goddess Issus — Zylor Bar’s plan for Lucy — to the city-state of Horz, which was populated by white Martians or Thermad [ŧür-mad]. Shortly after the wedding of jeddak (king) No Var Kim [Nō Vōr Kim] to Lotharian princess Sohna, we had circulated a rumor about a seenar, a rare gem used to power Zylor Bar’s time machine and our only way back home to Earth. Unfortunately, that resulted in the capture of Kal Kirad [Kal Kē-Rad], a red-haired Lotharian jedwar [ĵed-dwr, or admiral] and friend of Kam Han Tor [Kam An Tōr], a prince whom we knew was a secret follower of Issus. Our masena scout Olera Gala determined that predatory magongi [ma-gân-gē], likely trained by Zylor Bar, had taken him. That meant he was somewhere nearby. Capt. William “Rip” Rohrer and scout Kar Dalan went to the academy of mentalist Lum Tar O [Lüm Târ Ō]. They later reported seeing strange things such as acolytes staring at bowls of fruit and creating replicas that lasted only a short time before vanishing. The senior orovar [ōr-ō-vâr], or scholars of Horz, reassured Rip and Kar that he was not in league with the superstitious followers of Issus or Zylor Bar. Lim Tar O also said that he could not detect any trace of Kal Kirad’s mind in the city. Beauregard “Bo” Jennings and I visited the academy of biologist Ro Tan Bim [Rō Tan Bim] to learn more about the magongi. We followed a ramp down to a secret laboratory, where we saw skinless humanoids being grown in vats! Ro Tan Bim was surprised to see us, and we managed to conceal our disgust. We’ve heard that the Nazis are also pursuing eugenics, and Bo and I would have no place in such plans. The scientist — I’m beginning to think they’re all mad — happily told us of his plans for artificial life, or the “First Born,” which we realized were the later Barsoomian race and derived from his samples of Bo’s blood. We had to pick our battles, so Bo asked Ro Tan Bim about the magongi. He said they were arboreal, insect-like creatures organized into clans — similar to the Kaldane who bred the skeletal Rykors. 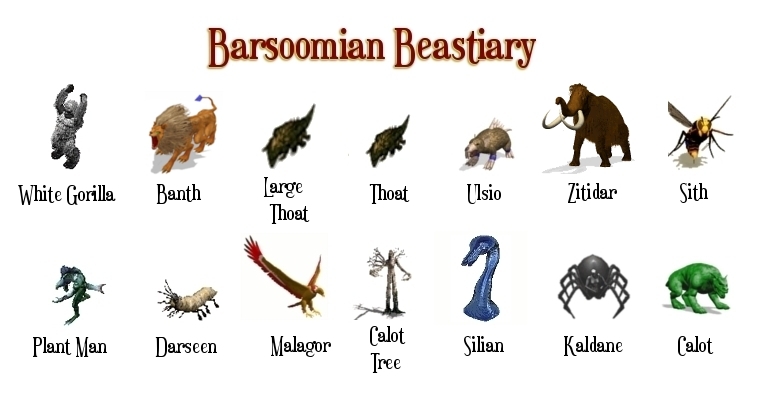 Apparently, these beasts liked to hunt humans and darseen, small chameleon-like animals like the masena. Ro Tan Bim noted that the nocturnal magongi were indigenous to Morbus Island, about two weeks’ sail across the Kalksus [Kal-ix-is] and Throxus [Ŧür-âx-is] oceans. I knew that the Dusar [Dü-zâr, or “northern fish”], an advanced ship whose design Zylor Bar had influenced so that he could later steal it, would somehow be involved. The naturalists used to send students to the islands’ five settlements for one-year stints, but shipping had recently been disrupted. We made a hasty retreat and regrouped with our companions. None of us wanted to visit “the Embalmer,” Le Um Lo [Lē Üm Lō] yet, so we’d have to do more detective work closer to Horz. At my recommendation, one-eyed Olera tracked the magongi. Their scent led us to the Tasor (Té-zōr, “sun tower” or lighthouse). We quietly climbed the long ramp. Betsy “Blaze” Harper and Bo readied their guns as Rip and I crept among 14 sleeping magongi. Olera went invisible, and red-skinned Kar drew his blade. It was only a matter of time before some woke up, and we noticed that the magongi were wearing “modern” Barsoomian harnesses with small crystals similar to the seenar. With his Jasoomian (Earthling) strength, Bo snapped the neck of one foe, as I pinned another with a sword. Amazonian Blaze shot another magongi, shaking it, and Kar swiftly skewered another. The creatures attacked Rip and me, and two teleported away using their harnesses. Fortunately, Rip was able to hold off the oncoming horde. Olera experimented with the buttons on the harness of a fallen magongi as I tried to get my head back in the game. Blaze dropped another, and Bo smashed one of the goon’s heads into a wall. Olera used her claws, and Kar maneuvered. Blaze showed off her marksmanship, picking off two of our opponents, and Rip and I dropped two more. Before the survivors could regroup, we grabbed the harnesses from some of the corpses and pushed buttons in unison. We found ourselves at the bottom of the ramp, but Van-tija [Van-tē -ĵâ], a dark-skinned “First Born,” and mutated masena “Blinky” were gone from where we had left them to keep watch. We tried pressing more buttons and teleported to a tower atop a mountain in the middle of some ocean! 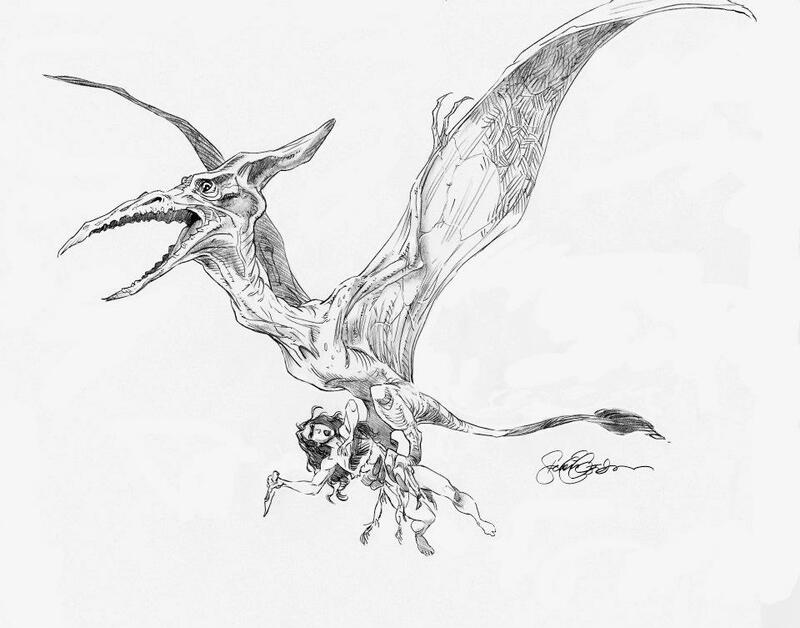 Two pterodactyls, which Kar called malagor [mal-â-gōr] but were known at this time as “Gwar” [gwr], stood in front of us. Each had an armed Thern, or White Martian, rider, and more armored soldiers approached. Bo tried jumping over the bird-like monster, but it grabbed him in its massive beak. The other rider spurred his mount to take off, and Kar used his harness to teleport in front of the guards. He wasn’t too happy when they hit him with numbing staffs. Blaze followed Rip’s lead and yelled that we should try to get control of a Gar. I leaped into the saddle of the one holding Bo and exchanged punches with its rider. Olera also jumped in to help, and the beast released Bo. Blaze shot one Thern, but another grabbed Olera, paralyzing her. Things went from bad to worse, as two mooks stunned Bo, and Rip got hit after killing just one of an approaching army. Kar finished off another guard with his sword and slayed one of the Gwar riders or Gwarthans [gwr-ŧan]. Blaze joined me in the saddle and finished off the rider. I told her to take control of the reins as we tried to rescue Rip, who was now surrounded by Thern troops. We swung around, and I saw that Bo, Olera, Kar, Van-tija, and Blinky were being taken away. We were over a forested island; I could make out an observatory and the Dusar in port, so we were somehow at Morbus Island. It was tantalizing and frustrating to be so close to Zylor Bar’s stronghold and so far from defeating him and returning home. The extra weight forced Blaze to drop me and Rip in the trees. We three Jasoomians were still free, but most of our company had been captured. We weren’t sure whether we should try to sneak into the enemy camp to rescue our friends or teleport back to Horz for reinforcements first…. 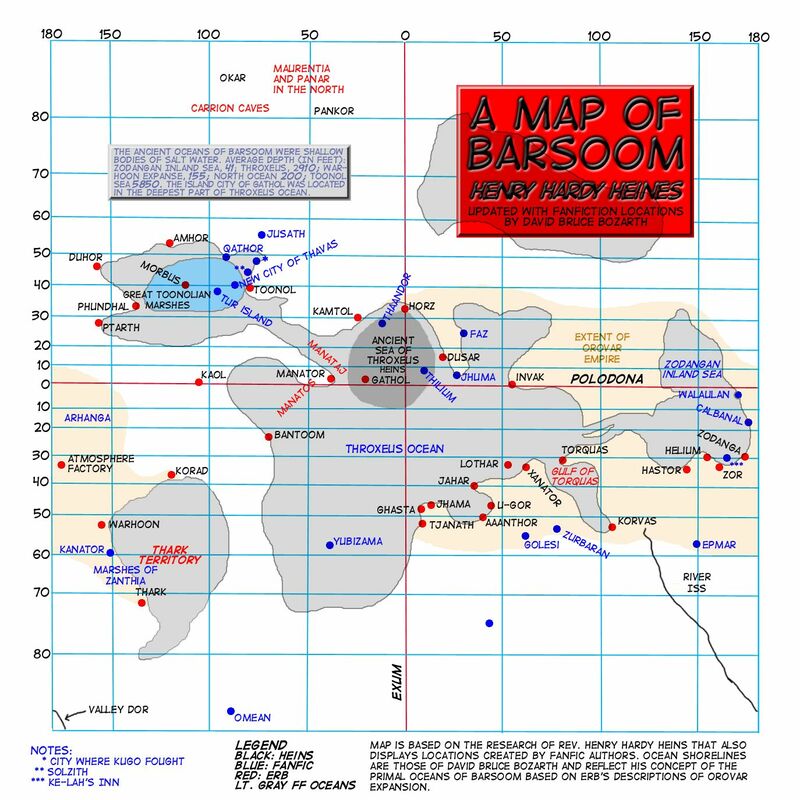 Posted on May 17, 2013 February 16, 2016 by GeneD5Posted in Games, Speculative FictionTagged barsoom, Barsoomian Adventures, mars, savage worlds, sfrpg, Tenth Ray of Mars, update.